For the Maratha clan, see Shinde. For the neighbourhood, see Scindia, Vishakhapatnam. Scindia (anglicized from Shinde and also spelled as Scindhia, Sindhia, Sindia, Sindhe, Sinde,) was a Hindu Maratha dynasty that ruled the Gwalior State. The Gwalior state was a part of the Maratha Confederacy in the 18th and 19th centuries, and a princely state of the colonial British government during the 19th and the 20th centuries. After India's independence in 1947, the members of the Scindia family became politicians. Jai Vilas Mahal, the current residence of the Scindia family. H. H. Maharaja Jayaji Rao Scindia (Shinde), the Maharaja of Gwalior, who built the Jai Vilas Mahal. The Scindia family of Kanherkhed originally served as shiledars (cavalrymen) under the Bahmani Sultanate. They later served the Peshwa (Prime minister of Chhtrapati Maharaj of Satara). The Scindia dynasty was founded by Ranoji Scindia, who was the son of Jankojirao Scindia, the Deshmukh of Kanherkhed, a village in Satara District, Maharashtra. Peshwa Baji Rao's career saw the strengthening of the Maratha Empire. Ranoji was in charge of the Maratha conquests in Malwa in 1726. Ranoji established his capital at Ujjain in 1731. His successors included Jayajirao, Jyotibarao, Dattajirao, Jankojirao, Mahadji Shinde and Daulatrao Scindia. The Scindhia state of Gwalior became a major regional power in the latter half of the 18th century and figured prominently in the three Anglo-Maratha Wars. They held sway over many of the Rajput states, and conquered north India. After the defeat of the allied Maratha states by the British in the Third Anglo-Maratha War of 1818, Daulatrao Scindia was forced to accept local autonomy as a princely state within British India and to give up Ajmer to the British. After the death of Daulatrao, Maharani Baiza Bai ruled the empire, saving it from the British power, till the adopted child Jankoji Rao took over the charge. Jankoji died in 1843, and his widow Tarabai Raje scindia successfully maintained the position and adopted a child from close lineage named Jayajirao. The Scindia family ruled Gwalior until India's independence from the United Kingdom in 1947, when the Maharaja Jivajirao Scindia acceded to the Government of India. Gwalior was merged with a number of other princely states to become the new Indian state of Madhya Bharat. George Jivajirao served as the state's rajpramukh, or appointed governor, from 28 May 1948 to 31 October 1956, when Madhya Bharat was merged into Madhya Pradesh. In 1962, Rajmata Vijayraje Scindia, the widow of Maharaja Jiwajirao, was elected to the Lok Sabha, beginning the family's career in electoral politics. She was first a member of the Congress Party, and later became an influential member of the Bharatiya Janata Party. Her son Madhavrao Scindia was elected to the Lok Sabha in 1971 representing the Congress Party, and served until his death in 2001. His son, Jyotiraditya Scindia, also in the Congress Party, was elected to the seat formerly held by his father in 2004. Vijayaraje's daughters have supported the Bharatiya Janata Party. Vasundhara Raje Scindia contested and won five parliamentary elections from Madhya Pradesh and Rajasthan. Under the Vajpayee government from 1998 onwards, Vasundhara was in charge of several different ministries. In 2003 she led the Bharatiya Janata Party to its largest majority in Rajasthan, and became the state's Chief Minister. In 2013 again, she led Bharatiya Janata Party to a thumpin win in the state of Rajasthan, winning over 160 out of the 200 seats in the assembly elections. Her other daughter, Yashodhara Raje Scindia, contested assembly elections from Shivpuri in Madhya Pradesh and won in 1998, 2003 and 2013 and also lokshabha 2004,2009 from gwalior. Upon the BJP's win in the state, she became the state's Minister for Tourism, Sports and Youth Affairs. Vasundhara's son Dushyant Singh entered the Lok Sabha in 2004 from Rajasthan. Ranoji Rao Shinde (1731 – 19 July 1745). Died 19 July 1745. Jayappa Rao Shinde (1745 – 25 July 1755). Born c 1720, died 25 July 1755. Jankoji Rao Scindia I (25 July 1755 – 15 January 1761). Born 1745. died 15 January 1761. Dattaji Rao Scindia (Regent 1755 – 10 January 1760). Died 10 January 1760. Kadarji Rao Scindia (25 November 1763 – 10 July 1764) Died ?. Manaji Rao Scindia (10 July 1764 – 18 January 1768) Died ?. Mahadaji Scindia (18 January 1768 – 12 February 1794). Born 3 December 1730, died 12 February 1794. 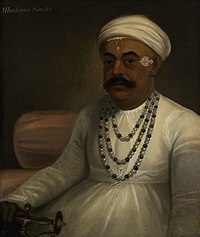 Daulat Rao Shinde (12 February 1794 – 21 March 1827). Born 1779, died 21 March 1827. Jankoji Rao Scindia II (18 June 1827 – 7 February 1843). Born 1805, died 7 February 1843. Jayaji Rao Scindia (7 February 1843 – 20 June 1886). Born 19 January 1835, died 20 June 1886. Madho Rao Scindia (20 June 1886 – 5 June 1925). Born 20 October 1876, died 5 June 1925. George Jivaji Rao Scindia (Maharaja 5 June 1925 – 15 August 1947, Rajpramukh 28 May 1948 – 31 October 1956. Last Maharaja, later Rajpramukh) Born 26 June 1916, died 16 July 1961. ^ Ramusack, Barbara N. (2004). The Indian Princes and their States. The New Cambridge History of India. Cambridge University Press. p. 35. ISBN 9781139449083. ^ Richard M. Eaton (19 December 2005). A social history of the Deccan, 1300-1761: eight Indian lives. Cambridge University Press. pp. 188–. ISBN 978-0-521-25484-7. Retrieved 16 July 2011. ^ The Great Maratha Mahadaji Shinde - N. G. Rathod - Google Books. Books.google.co.in. 1994. ISBN 9788185431529. Retrieved 21 July 2012. Hope, John (1863). The House of Scindea — A Sketch by John Hope. Longman, Green, Longman, Roberts & Green, London. Neelesh Ishwarchandra Karkare (2017). Tawaareekh-E-ShindeShahi. ISBN 978-93-5267-241-7.